The Free Chicago Seminars of Experiential Social Media for Nonprofits and social impact firms aims to help nonprofits and social impact firms to unlock the power of experiential to transform their commitments from their donors, volunteers and other supporters. The series will be offered by CSRA in Chicago starting Summer 2018. Experiential is “the nonprofit way” to do social media because its main goal is serving people, not marketing to them. And it usually produces much better business outcomes than social media and marketing. I designed this three-part public seminar series for nonprofits and social impact companies, and I’m making it available for free to qualified groups. I’ve pioneered the development of experiential social media since 2006, and I want to share a new way to build trust and commitment from donors, volunteers, partners, clients and other stakeholders to nonprofits and social impact firms. Most executive directors and development officers I know lament that it’s increasingly challenging to attract and maintain the attention of donors, volunteers, and other stakeholders. Many have seen traditional sources of funding shrink or vanish. Most “do social media” but have too little concrete results to justify or scale the effort. It gets attention by helping and serving people who correlate highly to your mission and services in digital public, where everyone sees and gets inspired by your care and relevance. It doesn’t coerce people to learn about your mission or services, but it facilitates direct connections to your donate/volunteer pages when they want to go there. In our tests, experiential outperforms social media marketing by 200-500%. I call it the “nonprofit way to do social media” because experiential is mission-focused, not organization/brand-focused. This series shows participants how to get started. These seminars are progressive, so they build on each other. Of course, I’ll account for people who haven’t taken preceding levels. All feature practical learning materials. Basic offers a minimal viable explanation of experiential social media and how can help nonprofits reclaim the ethical premium that they’ve unknowingly lost by adopting commercially oriented social media marketing practices. Then it shares a step-by-step process for organizing an experiential social media project. Reframing social media as interaction. How social media unknowingly encourages commercial thinking and sabotages nonprofits’ and social impact firms’ ethical premium with Stakeholders. How traditional social media fails nonprofits: examples. 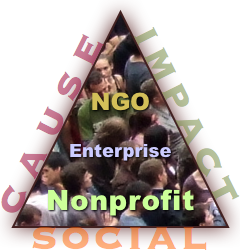 Nonprofit social media opportunities and pitfalls. Getting started with Stakeholders and Outcomes. Basic platform evaluation (how to select the optimal platforms to interact with Stakeholders). Basic project planning to create and manage teams of employees and volunteers. Basic team templates (setting up/organizing teams comprised of any combination of employees and volunteers). Intermediate introduces the power of Workstream Analysis into the mix. Akin to journey mapping, Workstreams enable nonprofits and social impact firms to understand the practical meaning of their services to stakeholders’ lives. Participants learn how to use Workstreams and Outcomes together to form much stronger relationships with Stakeholders. Interaction, the language of trust and preference. The power of meaning for your teams and Stakeholders. Using Workstreams and Outcomes together to empathize with Stakeholders and build trust and preference through interaction. Using Workstreams to manage dispersed teams of employee and volunteer experiential team members. Segmenting Workstreams to increase relevance, empathy and ease of interaction among dispersed team members. Amplifying and increasing ROI of events with experiential social media. Metrics: hierarchies of social actions and measuring trust quantitatively. The Advanced presentation adds several advanced tools to participants’ experiential social media toolboxes. Very few organizations are aware of these tools, and they have a ten-year track record, so using them adds significant competitive advantage. The Trust Business Chain Reaction explains how trust converts into more consistent donations and volunteering, referrals from other agencies, usage by clients, and more. Trusting Stakeholders and letting go of the perceived need to promote. Using experiential landing pages to boost conversion. Using social bookmarking to curate and republish links to interactions. Using platforms together: how to develop and adopt an ecosystem approach to experiential social media—and other communications. I’m organizing the series with an agile approach, so I’ll release dates as soon as they’re available. I plan lunch and evening formats to be held at nonprofit offices in and around the Loop. Check CSRA’s Facebook Page for event registration info (and to pre-register, so I can notify you of the first seminar). I’m currently talking with nonprofits with offices downtown to sponsor the seminars. Benefits include: no travel time, educate employees and board members, attract prospective employees, donors to you, and no sponsorship fees, either! Please contact me if you know someone who’d be interested. I’ve been pioneering experiential social media since 2006, so this site has hundreds of posts and pages about it. Here are some that you may find especially useful in the context of the Free Chicago Seminars of Experiential Social Media for Nonprofits. Experiential social media for nonprofits home page aims to summarize the game-changing opportunity it offers nonprofits and social impact firms. Experiential social media home page contains the most concise description I’ve yet managed. It also links to a video version. I have extensive experience leading seminars, training programs and presenting at conferences. I love sharing, and attendees say they feel the love! They also learn how to think differently about things.